The 1825 Consolidated Slave Act of Grenada is an example of one of the many pieces of legislation enacted in the Caribbean during the last years of slavery (roughly 1823 to 1833), with the intention of modifying the slave system to ‘ameliorate’ the condition of enslaved people. During this period there were two Orders-in-Council, one in 1824 and the other in 1831, which affected the Crown Colonies under direct British control such as Trinidad. Other colonies were intended to use these orders as the basis for their legislation. Legislative colonies (those with their own Houses of Assembly, such as Jamaica, Barbados, Antigua and other longstanding colonies) carried out some of these changes, but usually slowly and with much protest. Pierre’s petition argued that the indictment against him was incorrect, because it did not specifically accuse him of ‘mixing or preparing’ of material in the practice of obeah, but only ‘giving’ it. 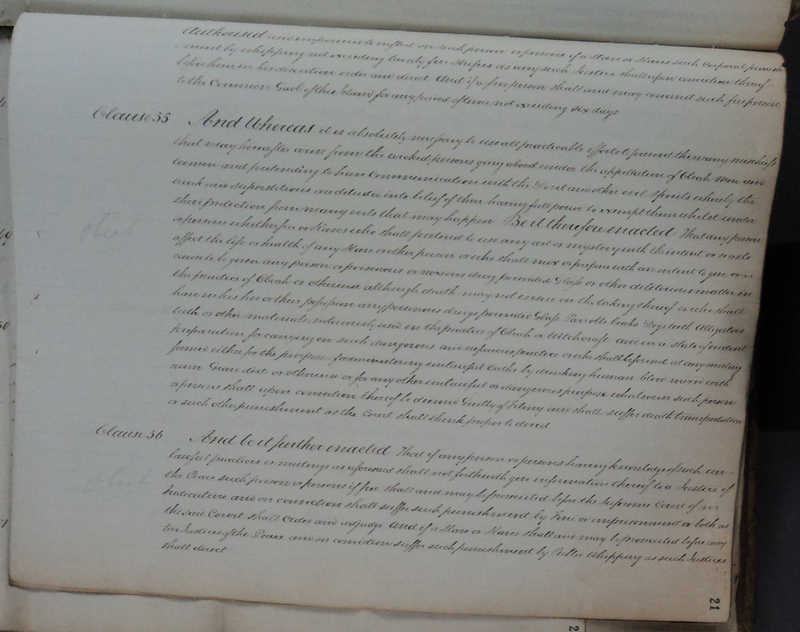 Folio showing Clause 35 of Grenada’s Consolidated Slave Act, 1825. TNA CO103/12. Image reproduced courtesy of The National Archives, UK. Clause 35 – And whereas it is absolutely necessary to use all practicable efforts to prevent the many mischiefs that may hereafter arise from the wicked persons going about under the appellation of Obeah men and women and pretending to have communication with the Devil and other evil spirits whereby the weak and superstitious are deluded into belief of their having full power to exempt them whilst under their protection from many evils that may happen. Be it therefore enacted that any person or persons whether free or slaves who shall pretend to use any art or mystery with the intent or so as to affect the life or health of any Slave or other person or who shall mix or prepare with an intent to give or be cause to be given any poison or poisonous or noxious drug pounded Glass or other deleterious matter in the practice of Obeah or otherwise although death may not ensue on the taking thereof or who shall have in his her or their possession any poisonous drugs pounded glass parrotts beaks Dogs Teeth Alligators teeth or other materials notoriously used in the practice of Obeah or witchcraft and in a state of evident preparation for carrying on such dangerous and nefarious practice or else shall be found at any meeting formed either for the purpose of administering unlawful oaths by drinking human blood mixed with rum Grave dirt or otherwise or for any other unlawful or dangerous purpose whatsoever such person or persons shall upon conviction thereof be deemed Guilty of Felony and shall suffer death transportation or such other punishment as the Court shall think proper to direct.